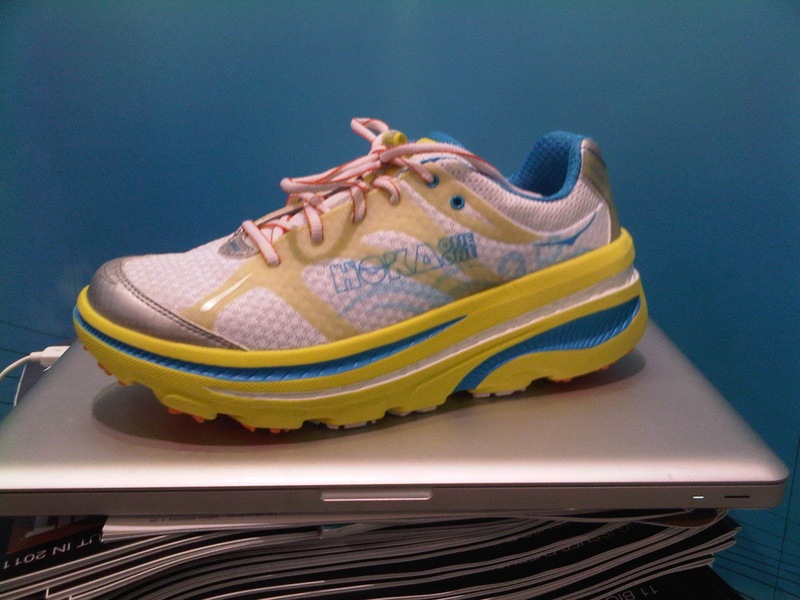 I have previously posted about the counter intuitive and bold Hoka One One Mafate "natural running" shoe. While a trail shoe they are my current favorite for long road runs and recovery. Feel like running on grass on the road. Legs stay fresher during and after runs than any other shoe I have ever run in. I visited Hoka's booth and talked to Nicolas Mermoud, co-founder about their new road shoe the Bondi-B. The Bondi-B is 8.8 oz in size 9 vs 10.8 oz for the Mafate. Bondi-B has 10% less cushioning than the original Mafate which should make them snappier without losing the leg saving properties of all the midsole foam. 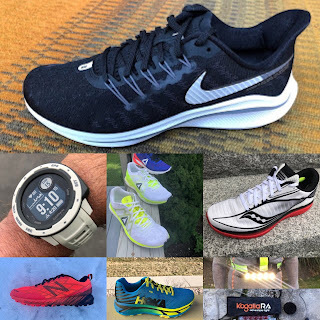 Update: Running Times Outdoor Retailer article reports a 4mm heel to toe drop. When combined with the soft foam I believe the Bondi is effectively zero drop. The upper is lighter and the toe box is seamless on top. It does not have the middle seam of the Mafate. The seam was never an issue for me but it seemed unnecessary. Glad it is gone. The rocker sole seems a bit more pronounced. Hoka's are stiff and rely on the rocker sole to keep you in a short, forward leaning, mid foot efficient stride. You can feel this stride and unlike other shoes stride form seems to stay consistent even when tired. Update: I interviewed Karl Meltzer, podcast coming soon, and according to him one of the key strengths of the rocker sole is that it allows a faster cadence than other shoes he has run ultras in such as LaSportiva Fireblades and Montrail Vitesse. The Bondi-B outer sole is designed for road use. Update: While they have only had them for a few days both Karl and Dave Mackey plan on doing all their trail running in Bondis despite the less pronounced lugs. The trail Mafates outer sole lugs wear quickly on the road. I did a brief run down the aisles in the Bondis and they felt very responsive. The forefoot is noticeably more flexible than the Mafates. They seemed to be half size small on my foot. I hope to test a pair soon and likely will run Boston in them. I am thinking they will prove themselves after Heartbreak Hill on the downhill and into the homestretch. As far as the wild look and colors, I say go with it! Karl Meltzer who did an incredible 2064 miles in 50 days along the Pony Express Trail in Hoka One One Mafates was also in the booth and looking none the worse for wear. Told me it would have been impossible to pull off his feat and still have feet in any other shoe! His last day on the Trail was across the flats of Nebraska for 105 miles and he said the next morning he was ready to run again. I believe him. Available in early to mid February. Wasatch Running Center,Salt Lake Running, Boulder Running Company have them and will ship.. I expect there will also be a limited number of other stores and online retailers. Will update dealer list when I hear. Update 3/12: Post with video from Hoka One One on shoe performance. 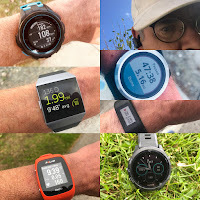 Outdoors Magic UK 1/24/2011: Hoka One One founder is quoted as saying that Hokas are intended “to allow people to run longer, to run more often, and to run without injury”. Based on my experience with Mafates, I agree, I believe Bondi-B will be even more versatile.